I plan to get myself a Digitone to add to my little "Studio". Until now I only have the Circuit and AUM (iPad) which to sync and midi is really easy (Apple CCK). What I want to do with the Digitone added, is not necessarily to remote control all component with the Digitone Midi Tracks but to have all three in sync together. I read a bunch of stuff and watched a few videos but unfortunately I couldnt get my clear answer, if this is possible (I am pretty sure it is) and how it is done. Until now I would think: Midi out from the Digitone into the Circuit and the iPad with CCK/USB-cable into the Digitone. But then is the question if I can bring AUM to receive midi clock or anything the digitone sends to sync. I think I have missed something here.... I am pretty new to this syncing and midi connecting, so I would be really glad for any help or insights into the right direction. You will need a nice USB Hub to route all midi thru it since both devices support Midi over USB. And then you would set the Digitone and Circuit to receive Midi Clock/Sync from AUM. This is how I've set things up with my few pieces of gear...Circuit included. Thank you, @echoopera ! THAT was fast! Its actually not that complicated then (hardware wise, howto set it up in AUM will be another quest then). Yeah, what's great about this is that the USB Hub will allow you to communicate to the synths and receive from the synths. The great thing is as you add more gear, the Hub will support you and allow you to connect everything to the iPad via the CCK from that Hub. thanks again, mate! Really appreciateded your fast and detailed help here. This morning I pulled the trigger and ordered the Digitone. I am excited to welcome him to the family. You really know this stuff, so I would be glad if I could catch you again, if I have any upcoming difficulties. I absolutely see the advantage of the Hub, really cool... since I actually have some other midi controllers around. Do you by accident have a nano key studio? This will not allow USB since it needs more power than USB provides. It may even work then with cable with a powered usb hub!? USB Midi seems the way to go in my case. Thanks again, man! My pleasure. Been on the journey so i am glad to help. I do have a nanokey studio and yes it will work via cable USB on the HUB. I’ll try and record a vid in a week or so showing the setup process. I have a Circuit, Octatrack, Minilogue, Push2, Toraiz AS-1 and a couple other midi controllers all routed into AUM at times to jam on soft synths. One thing i love about the OT and Circuit is that i love sequencing iOS synths from them. Interesting you do this with AB3. I need to dig more into that it seems. oh and thanks for the nanokeystudio-answer great to hear that. I may need to develop a sort of initial patch for AUM with my midi stuff hooked into or so. So it seems more people have a need of Midi, Connection, Sync and more?! Anyways, problem I faced: I have connected iPad to hub and circuit and DN to the iPad that way. But... I can only send midi clock to one device out of AUM?!? 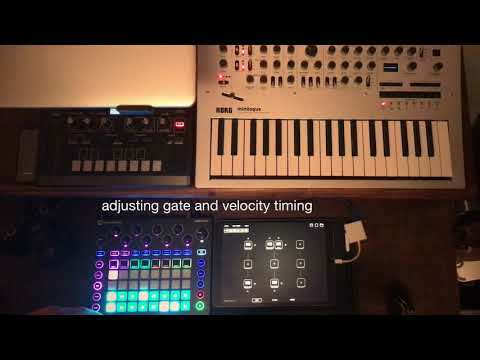 Is there a way to send midi clock to more than one device? I will tag you here @echoopera since you already helped me a lot here. Thanks Sir! I think you just need to set the DT to receive midi clock and you’re good. It should pick it up from the AUM host in the routing config...the Midi routing symbol in the sidebar menu...3 vertical lines. Maybe I can get a midi cable and hook up the Circuit to the digitone and send from the digitone midi clock to the circuit too!? unfortunately aum will allow me to send clock either digitone or circuit. but maybe I can get the circuit through the midi cable to the party!? Cool. Just get that Anker USB hub and plug the circuit and digitone into it and route that into the CCK and route from AUM to either device. Just for my information does audio is passing thru usb with the Digitone, or is it just midi ? In that case the Digitone is acting as a sound card I suppose ? yeah, as you said, only midi through usb. this setup has to be audio connected into the DN (Left+Right) and USB, bet via hub into the CCK into iPad.